HomeGrown Marine | Homegrown marine instruments. I’ve been cleaning up the boat computer package I’ve been building and want to put it out there so you all can use it and contribute to it. 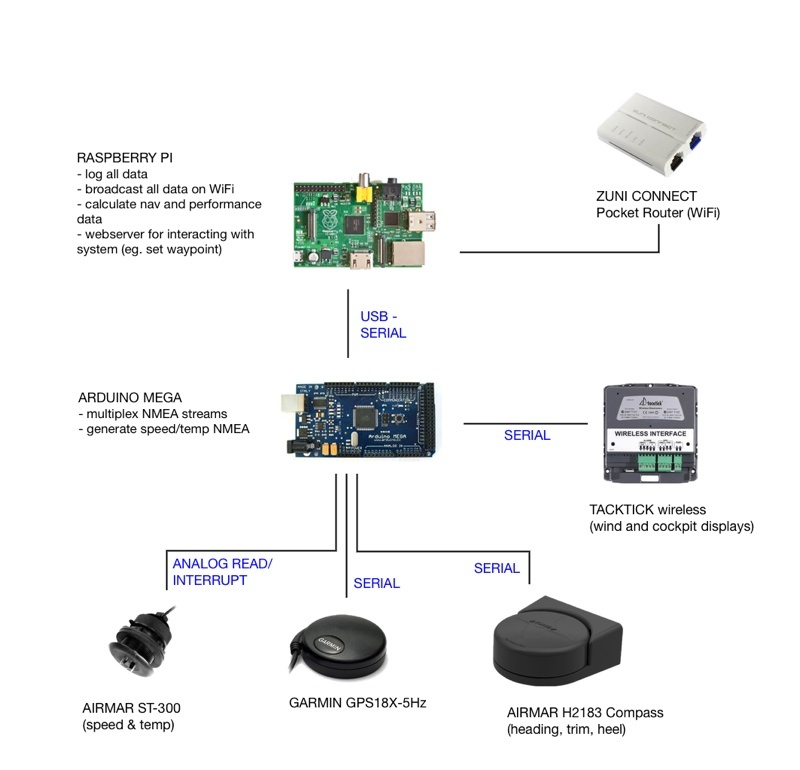 The goal here is to turn a $35 Raspberry Pi or Beaglebone Black into a sensor hub and processor, similar to the B&G H5000 or any other regatta processor. The package provides several functions through a modular ‘app’ system that I’ll talk about in a bit. It enables calculation of complex data like true wind and currents. It broadcasts all NMEA messages over UDP, so that the sensor data can be displayed in mobile apps like iRegatta and NMEA Remote. 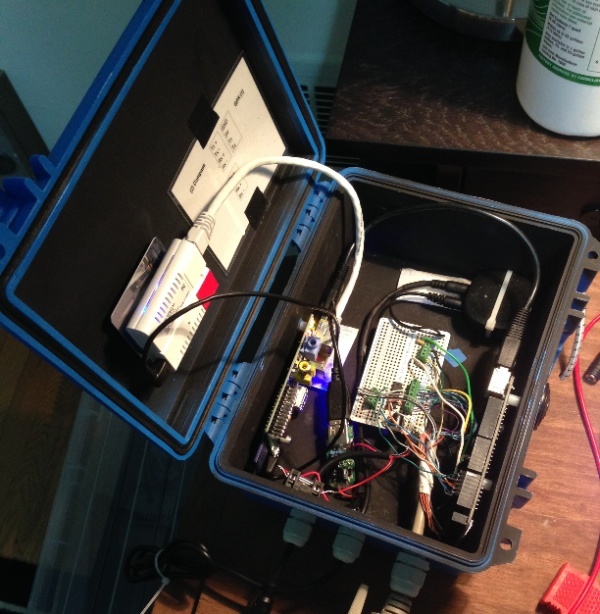 It logs all NMEA messages to the Pis disk, and enables downloading of the logs to mobile devices. 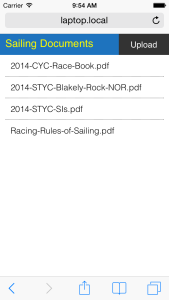 It stores your sailing instructions so that you can reference them while on the water. I’ve also started developing some add on apps. 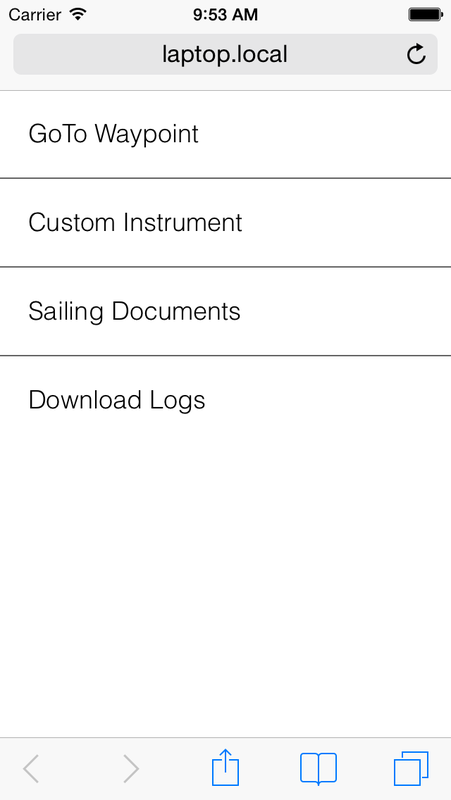 These three arguments give the app access to the NMEA data stream, the sailors, and an easy place to store simple configs. 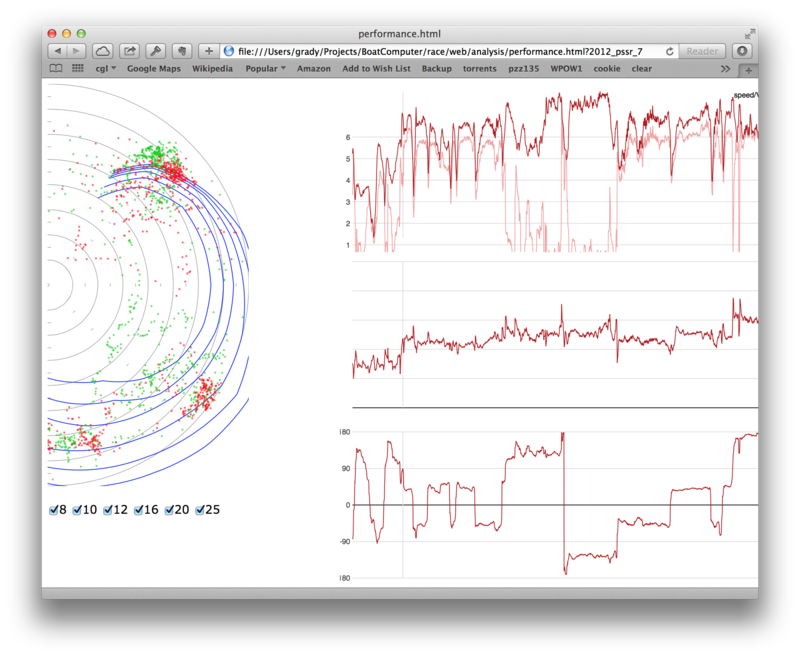 boatData – an interface to the boats sensor data. settings – an interface to get and set simple config values. 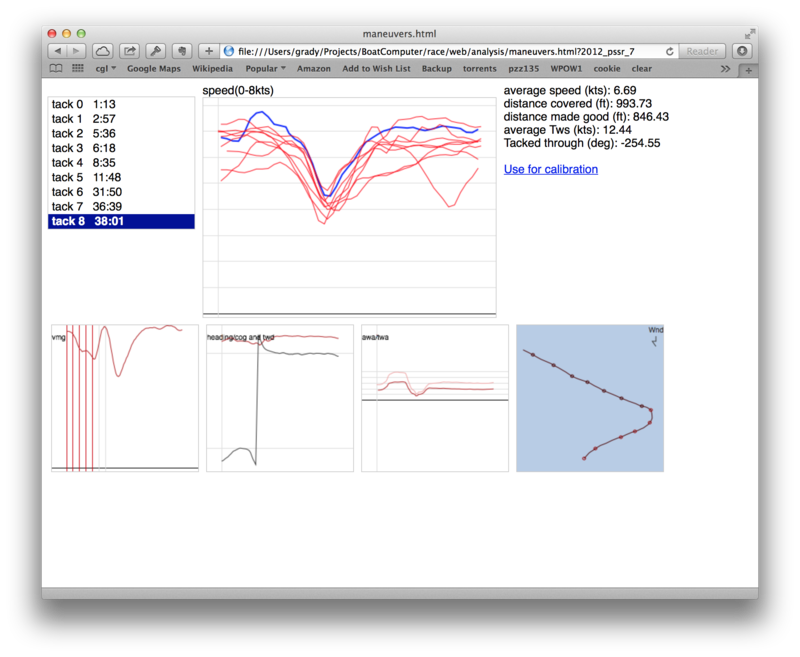 You can write simple modules that just interact with the sensor data. 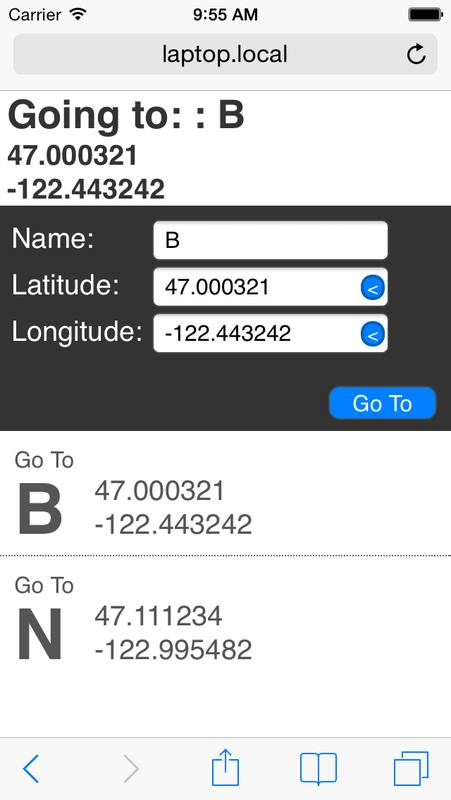 With Node.js’s event based patterns, its pretty easy to create an app that calculates current from speed, compass, and gps sensor data. //broadcast the new bit of data. 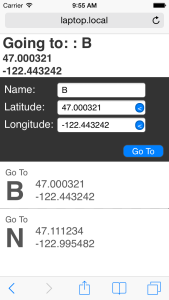 boatData will handle NMEA formatting. 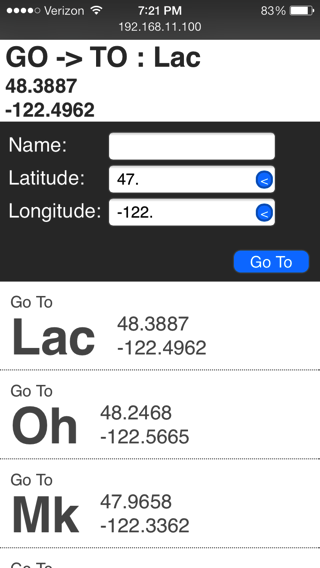 Or to create an app to show more sensor readings (or custom calculations like ‘target speed’) on your tacktick displays. //tacktick message and send it back out. 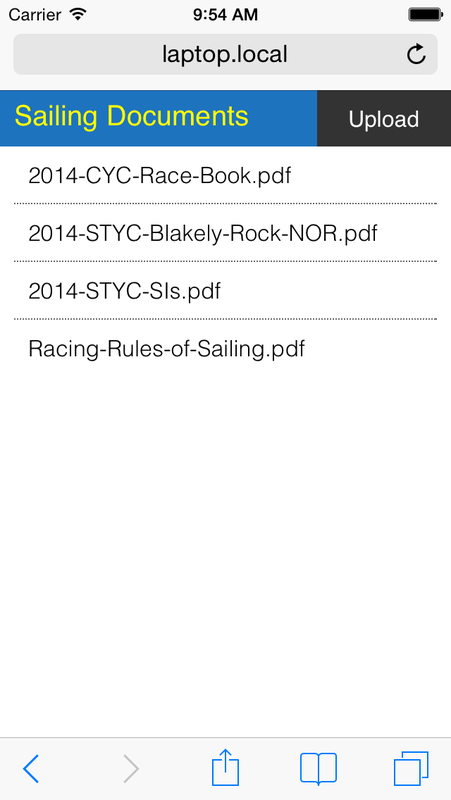 Or modules that just give sailors access to the boat computer, like the Sailing Documents App. 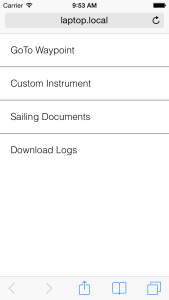 Or you can make complex modules that have a web app for entering data, and use that data to calculate and broadcast new data to the NMEA network. See GoTo. Check out the source, install it on your boat and give it a go. 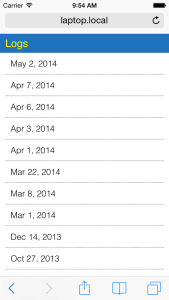 Let me know what you think in the comments, or through GitHub’s issue tracking. As I’ve learned to sail, I’ve constantly wanted better data out of my instruments so that I could better analyze the performance of different maneuvers. Moving to a 5Hz GPS last year really illustrated this point. 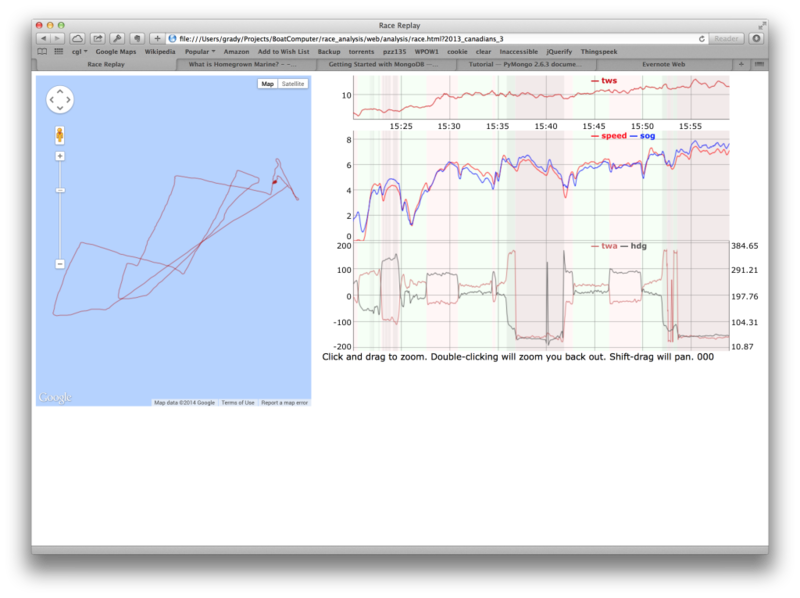 Here, you can see a tack, where the speedo never even registered within 3/4 of a knot of the lowest speed, and was well over a second behind the GPS in response (this isn’t just a calibration issue, we were in a little bit of current). After reading Merlin’s excellent blog here: http://sailboatinstruments.blogspot.com/2011/03/measuring-boat-speed-part-1.html, I decided I could just hook the signal wires from the speedo into the Arduino in my Boat Computer (link). I realized that if I really wanted a fast response, I’d need to filter the raw pulses. I figured that I could output 5 or 10Hz, filtered from the raw pulses, and that other parts of the system shouldn’t need to do additional filtering or smoothing. I researched a bit about signal smoothing and after a little trial and error, decided to go with a simple weighted average using approximately the last 1s worth of pulses. I went with a scheme that weighed the most recent point twice as heavily as the oldest point. 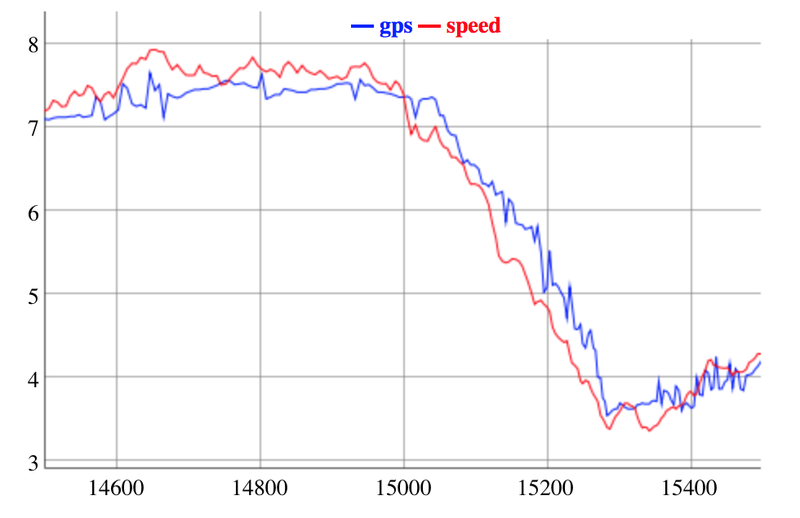 In the end, calculating speed at 5Hz, this system responds faster than my GPS. I hoped to do a better test last weekend, but had some power issues on the boat. 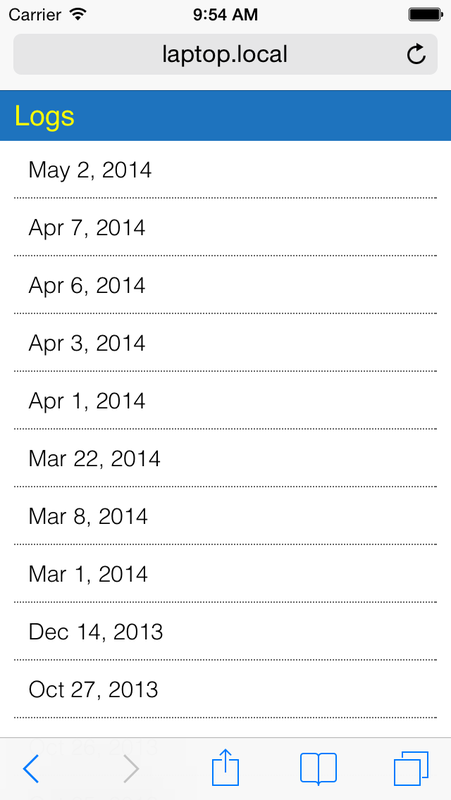 I’ll post more results in March when the season picks up. I’ve posted the code here: https://github.com/HomegrownMarine/better_speedo. Let me know what you think, and if you have suggestions about how to do things even better.